Update: As of 11:00 a.m. maintenance has been completed and phone systems are back to normal operation. Thank you for your patience. 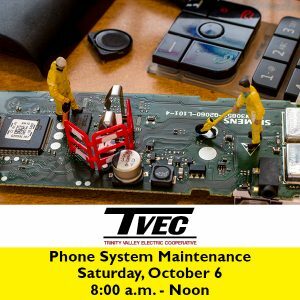 TVEC phone systems will undergo maintenance and updates 8 a.m – Noon on Saturday October 6. This includes the regular call-in numbers and the automated phone system for payments and account information – (800) 720-3584. Outage reporting will be unaffected. Report outages at 800-967-9324 or via outage texting. We will update this post when normal service has resumed. Thank you for your patience.